from automating and streamlining its health and safety compliance process. Data are continuously updated and applied throughout the system to match the work flow. Checks for and ensures accuracy, timeliness, and completeness as data is recorded or updated. 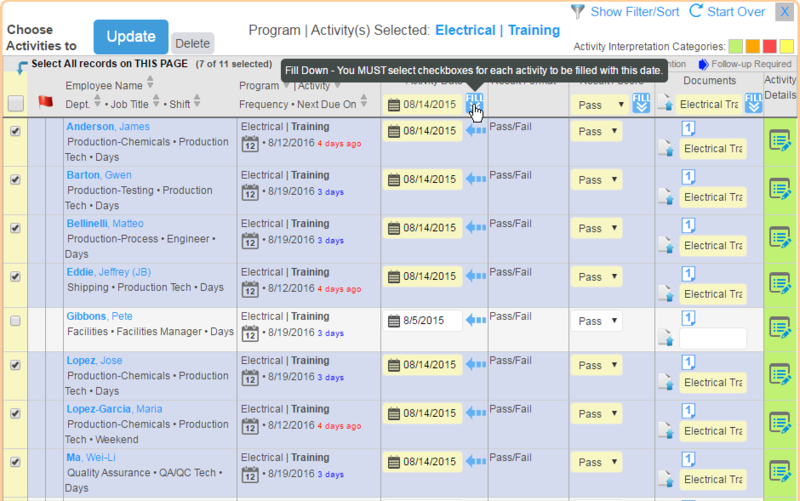 Schedules and tracks activities for timeliness, and measures compliance performance according to real due dates. 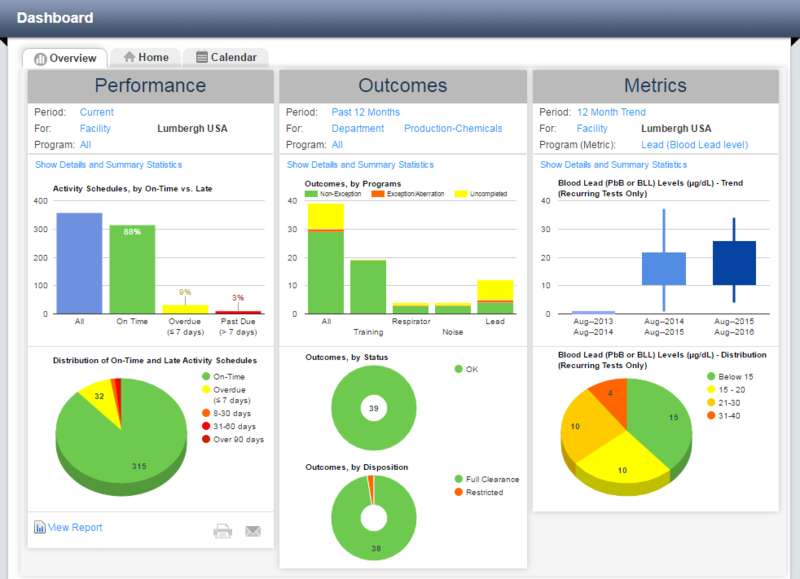 Dashboards automatically aggregate and measure actionable data and statistics such as outcomes, performance and selected metrics for the entire facility or selected departments, programs or time periods. Continuously updated reminders, flags and warnings ensure that follow-up tasks, exceptions, and incomplete activities are prioritized, executed, and adequately documented. Historical activity data is automatically compiled as data are recorded for each employee activity and displayed in tabular and/or graphical format. Automated email distribution of dynamically generated individual and aggregate reports. Click a thumbnail to enlarge and display. 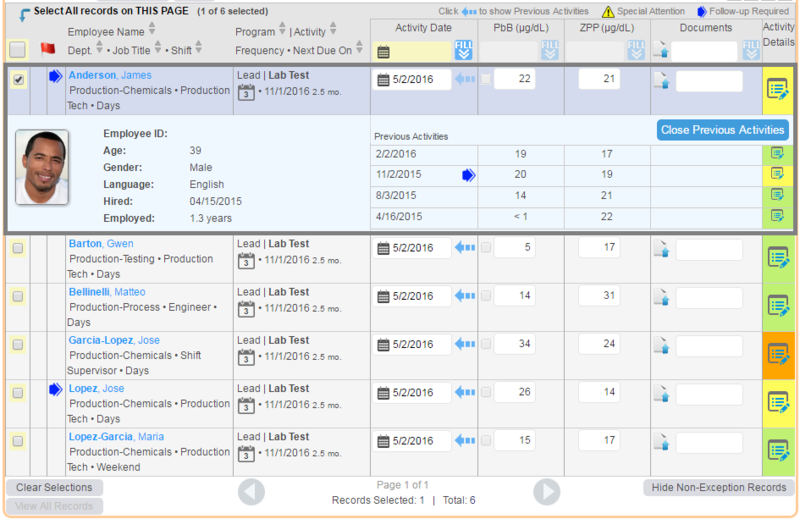 One-click navigation to employees, schedules, results, reports, lists and documents. 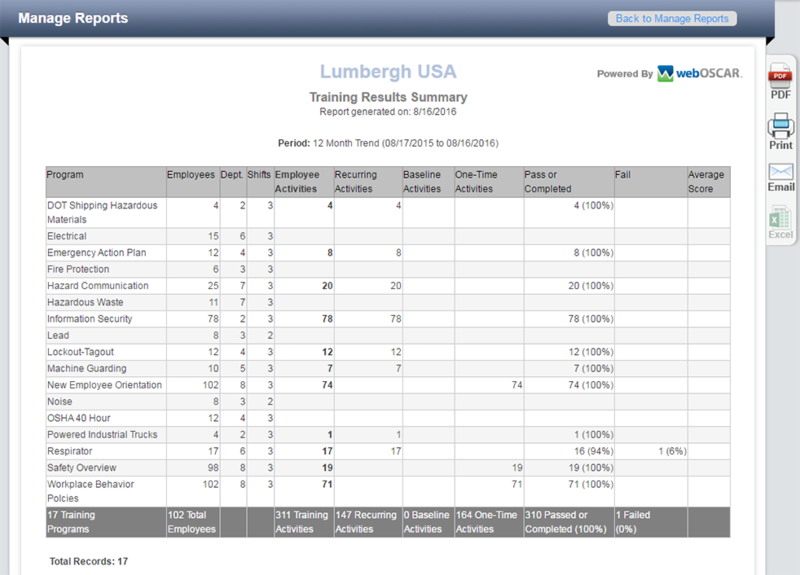 Data AND corresponding documentation for every activity are managed in one place. Continuously backs up and maintains data integrity –so information is never lost, corrupted, or misplaced. Single or multiple facilities within an organization can be managed in the same application. Encrypted, password-protected access for any authorized user is available from any internet browser at any time. Multiple users can simultaneously access the system. 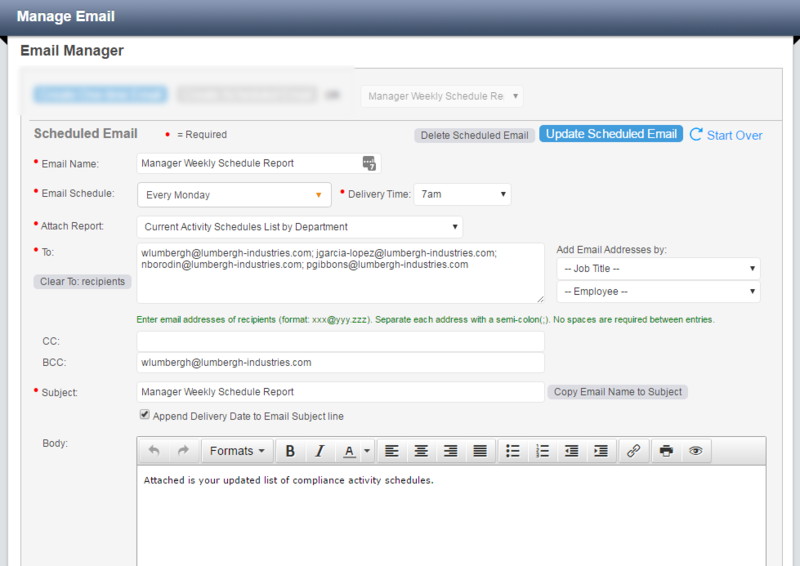 Email management of recurring automated reports can be generated automatically at any frequency and delivered to multiple recipients inside or outside the organization. Automate the most common and repetitive tasks, and manage current and historical data and documentation as well as future requirements and schedules in an easy-to-learn-and-use system. One-click mass entry of virtually any combination or quantity of employees, schedules, activity data or documents can be done in a single transaction. 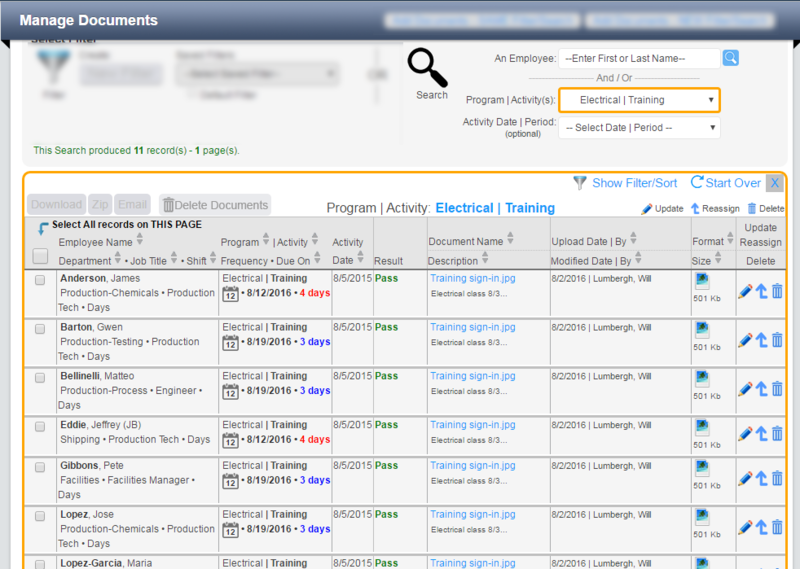 Filter/search customization to record, view, or “drill down” to virtually any combination of employees, departments, jobs, shifts, programs, activities, or time periods. Automated scheduling of next due dates after activities are recorded, with ability to customize or update selected schedules for exceptions and follow-ups. Documents (PDFs, faxes, scans, photos) are uploaded and linked directly to employees’ specific activity data—making them fast and easy to record, view, print, or deliver via email. Filtered, sorted, and aggregated data are displayed and outputted in easy-to-read tables, graphics and reports in easy-to-use, familiar formats such as PDF and spreadsheets. Notes and Remarks for employees’ activity data are easily recorded and stored to support and document decisions, actions, and follow-up tasks. Each customer Organization’s and Facility’s processes, preferences, and compliance requirements are automatically integrated into the work flow and data management. Any regulatory jurisdiction requirements or internal policies can be configured for interpretation and scheduling each organization’s or facility’s compliance programs and activities. Automatically integrates Facility-specific departments, jobs, shifts, suppliers, PPE, and key compliance activity requirements into the work flow and data management. Identifies and tracks temporary or permanent exceptions and incomplete activities, and links them to follow-up actions and tasks until they are resolved or concluded. Dynamically generated aggregate or individual employee reports can be displayed, outputted as PDF or spreadsheets, and delivered automatically via email to multiple recipients based on customized scheduled dates and times. Audit trail documents all major transactions and changes by user, with date stamp and time. Integrate employee data from human resources/HCM, ERP and other systems and processes.